John told me that he'd snagged tickets to the San Francisco Ballet's production of Nutcracker, so a little before 5pm on Friday night, I slipped into his favorite Diane von Furstenberg red polka dot wrap dress. He picked me up at the office and we snacked on steak tartare and french fries while sipping Champagne at Chez Maman before headed to the opera house, where the Tchaikovsky classic actually had its US premiere in 1944, for John's very first ballet performance. He'd been vague about where we were sitting, but when a steward opened the darling little door to our center box and gestured to the first two seats, I had to surpress the urge to squeal–and the bubbly delivered a few moments later didn't help! After the gorgeous performance, we decided the very best thing to do would be to continue exchanging our Christmas presents early; I'm headed to the East Coast on Friday afternoon and John will be on a different plane to Texas, so we won't be reunited until the 27th! We couldn't resist pulling the mattress and a big pile of pillows into the living room, and sipping the Sauterne from John's stocking while we giddily opened each others' gifts. We've only used the heater in our apartment once; I came home and discovered a sickly looking John napping under a thick cloud of natural gas, so we figured it was better to pile on the sweaters. But this weekend was so chilly, we spent the majority of Saturday with the blankets pulled up to our chins with library books and cups of cocoa! We had a big beautiful breakfast of poached eggs and roasted fingerling potatoes with freshly squeezed orange juice, then dove back into bed to watch our breath float out in front of us! Eventually we braved the chilly wet weather for a little Indian food, then drew a scalding hot bubble bath before curling up with The Holiday. John was up early on Sunday morning and went on an expedition for espresso and Gruyere; he whipped up the most delicious omelettes stuffed with cheese, onions, roasted potatoes and little slivers of chicken apple sausage while I was still dozing. After breakfast and some cleaning up, we bee-lined to Sightglass for caffeine and people watching. We knocked a few other downtown errands off our list before heading to the grocery store for provisions; John made a delicious vegetable curry while I pursued my favorite blogs and prepared for the week ahead. I even managed to squeeze in a little yoga while my favorite chef worked in the kitchen, and over a shared Sapporo, we toasted to an absolutely perfect weekend. Tell me, what were you up to this weekend? Attending holiday parties, singing carols or maybe a lap around the ice skating rink? Image by The Studio B Photography, Bouquet by Virtu Floral & Event Design. what a wonderful weekend! I love that john surprised you w tickets in the box + champagne! i saw the nutcracker a few years ago and i swear we need to make it a holiday tradition. your version sounds like perfection. Your ballet date sounds amazing! I am so missing the Nutcracker this year. But I am listening to the album as I type...kinda close! Loving this photo of a winter bride! We had a wonderful weekend, the highlight being our annual holiday date night in NYC. Sounds like a wonderful weekend! 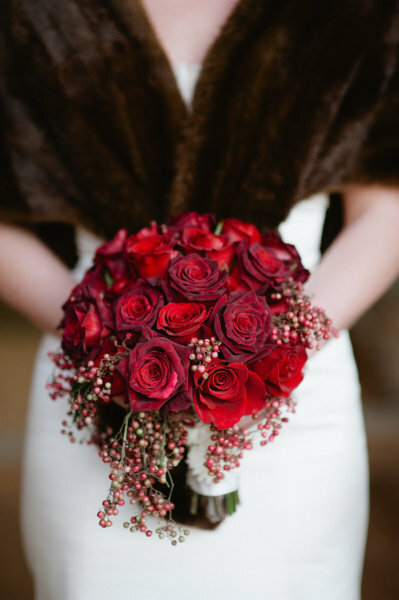 I love the photo...the bouquet is absolutely gorgeous! your weekend sounds like a dream! safe travels and happy holidays to you guys! Could I get any more envious of your weekends, they always sound so dreamy!! I am looking forward to the kiddies ending school and a weekend full of holiday fun with a few parties added to the mix! Sounds like another perfect weekend!!!... oh and BTW i LOVE that bouquet!!! Such romantics! This sounds straight out of a movie! I'm dying to see the nutcracker this year...where has the time gone? I saw Elf... All I need is the holiday to make things perfect!!! Heaven!!! What a sweet surprise! Can we trade...I'll let you have Mac? We don't spend Christmas day together either so I love doing presents early too. I think I want to live in your weekends! It sounds fabulous and delicious as usual! We are exchanging gifts early too but its mostly because I don't like to wait to give them! !